This bourbon peach tea is the perfect summer cocktail and best of all you can make it by the pitcher. Sweet, refreshing, and enough of a bourbon kick to say, welcome to the south, y’all! What Do a French Vacay and Spiked Tea Have in Common? As I write this I am 35,000 feet in the air just returning from France. It’s amazing to me that I can sit in a plane going something like 600 miles an hour, in a crazy altitude, and message with family and friends or do a little work. Plus wine, of course. Yeah for technology! My birthday vacation in France has been amazing and I want to thank all of you who were kind enough to wish me a happy birthday on the Facebook page. It really was wonderful and I ‘ve seen so many things I’ve only dreamed about in the past. Plus I have lots of images to share and recipes to create. I’ve been inspired! I’ll also be reviewing the tour, the places I’ve gone, and the hotels plus giving you advice and tips for your French vacation! I’ll be sharing over the next several weeks so please subscribe to the newsletter in the sidebar so you don’t miss any of it. 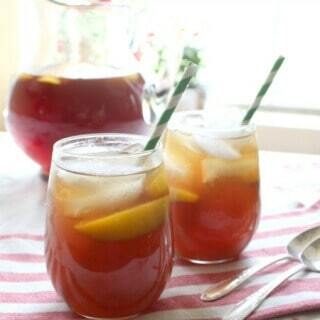 The Perfect Spiked Sweet Tea!! Let’s talk about summer in the United States, though. More specifically, let’s talk about summer in the South. Hot, muggy, and oppressive– our summers are almost unbearable sometimes. Many of us spend afternoons on the porch where we can catch a cool breeze — and a porch is incomplete without a pitcher of sweet tea. I’ve taken this sweet tea to another level with the addition of bourbon and peaches. I guarantee that you’re friends will be asking for this recipe way before the summer is over. Keep a pitcher of this available for those drop in guests — you’ll probably find that the number of “drop in guests” goes up quite a bit. Now, honestly I’m in a plane and I’ve had a couple of glasses of wine… so if there are typos I’ll try to catch them early next week when I’ve recovered from my travels! This is a little shorter than usual but I am hoping to get a nap in before I get home. I can’t wait to share more about France with you! This pitcher and glass set is perfect for serving your bourbon peach tea! It’s very “southern” to take the tea and glasses out to the porch to sip and watch the world go by. Fresh, bourbon vanilla beans are exactly the right way to take the flavor in this drink right to the top. Here’s the bourbon peach tea! Give it a try and let me know what you think! Cover tightly and keep in the refrigerator overnight. Next day the sugar will be dissolved and the mixture will be juicy. Blend the peach mixture until smooth. Add the sugar and bring just to the boiling point, stirring until sugar is dissolved. Add 2 tablespoons of the puree, the bourbon, and the tea to the glass. Stir to blend and add the peach slices to garnish. Peach and bourbon is a perfect combination! Spiked iced tea? Yes ma’am. And now that peaches are coming into season and the temps are rising, this is the perfect hot weather drink. 🙂 well, I think I am going to need spiked hot chocolate here. We’ve had such a cold rainy MAY! A pitcher of this would be perfect this weekend around the pool! I’m a bourbon girl and I love peach iced teas, so this is the perfect combo for me! So great for summer. I may be from the North, but I can appreciate a good sweet tea. The brown sugar and vanilla bean mixed with peach sounds absolutely divine! I look forward to reading about your trip to France. Oh I love the sound of this refreshing drink!!! Yes, must keep a pitcher on hand at all times. Our Memorial Day weekend is forecasted to be a scorcher, this will be something to look forward to after planting the garden on Monday. Have a wonderful long weekend with your family. I can’t believe living in the South my whole life, that I have never had Bourbon Tea! Sounds amazing. Happy belated birthday! 😀 I’m sure you had amazing food in France, but this Bourbon Peach Tea will be like a mini-vacation to me. Looks divine! Thanks! Yes I did… but there’s no place like home. The beginning of this post I immediately thought, man she is living the life. I hope you had a great birthday in France. Plus this drink looks amazing. France? How exciting!!! I can’t wait to hear more about it! And I’m excited to try your Bourbon Peach Tea too…I can see sipping this by the pool this summer! 🙂 it’s absolutely perfect for exactly that! cannot wait to hear all about France!